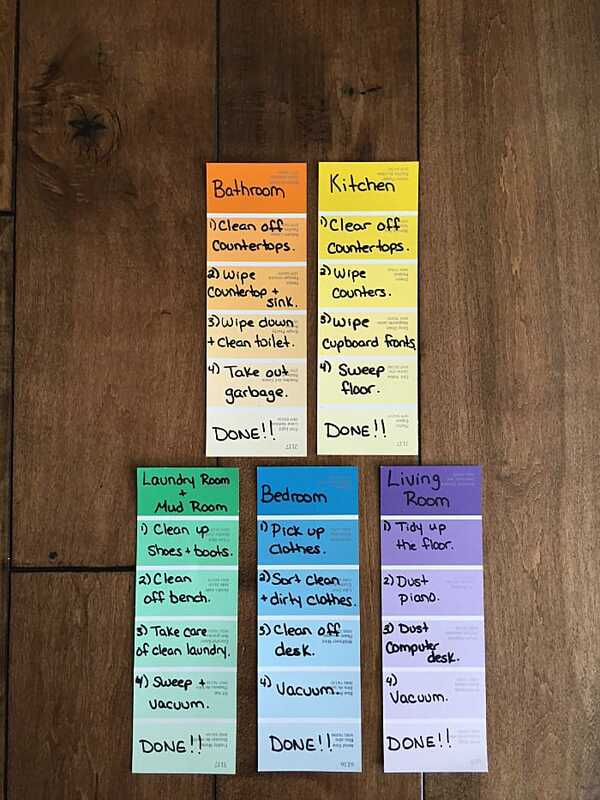 A chore chart is quite common to see in many homes with young children. We all know that chores are an important part of childhood and even young children by the age of 2 can help with simple tasks around the house. These chore ideas are great for kids of all ages. Something that I have come to realize, is that when I say “Go clean your room”, I have a very specific idea of what that means. However, my kids are not mind readers and they don’t know what I am expecting when I open their room door next time. For some children, the thought of cleaning their bedroom can be completely overwhelming and they do not even know where oh how to begin. So I’ve come up with a simple chore chart that will help my kids understand what I am expecting, step-by-step. 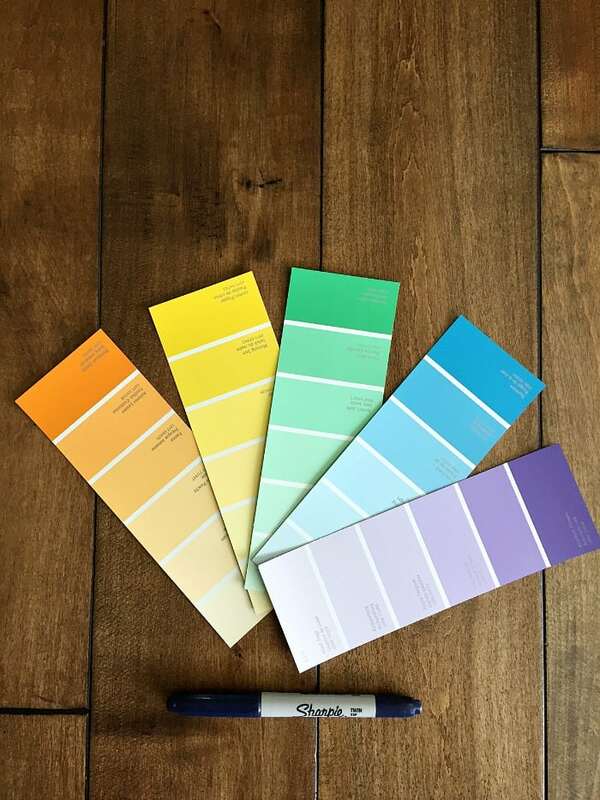 STEP #1 – pick up paint chips from your local paint store in the colors of your choice. STEP #2 – choose which chores you will want your child to complete. STEP #3 – write out what you expect done in that room. For instance, if it is the living room, I expect my children to clean all items off the floor, dust the piano and computer desk and vacuum. STEP #4 – my children tend to get distracted once they start cleaning. 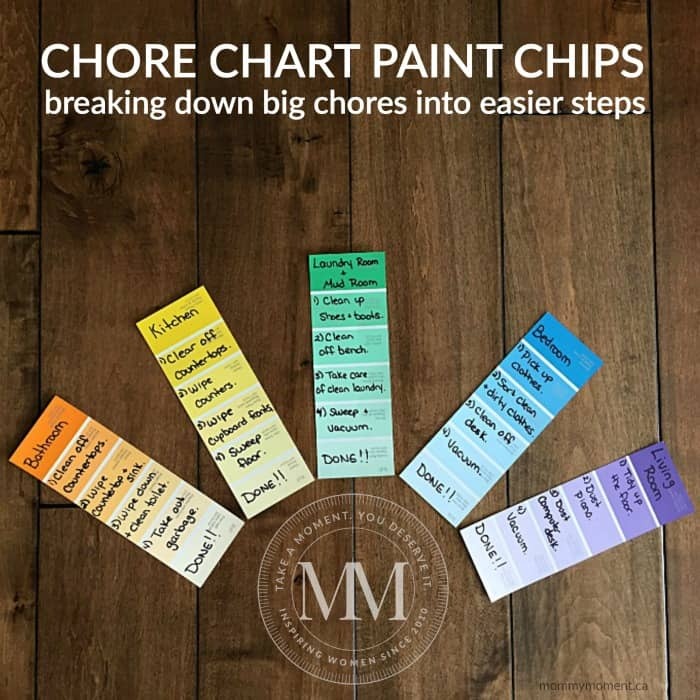 With this paint chip chore chart, when it is time for your child to complete a task, simply hand them the card and they will know exactly what the expectations are. WHAT CHORES DO YOUR KIDS COMPLETE ON A DAILY/WEEKLY BASIS? 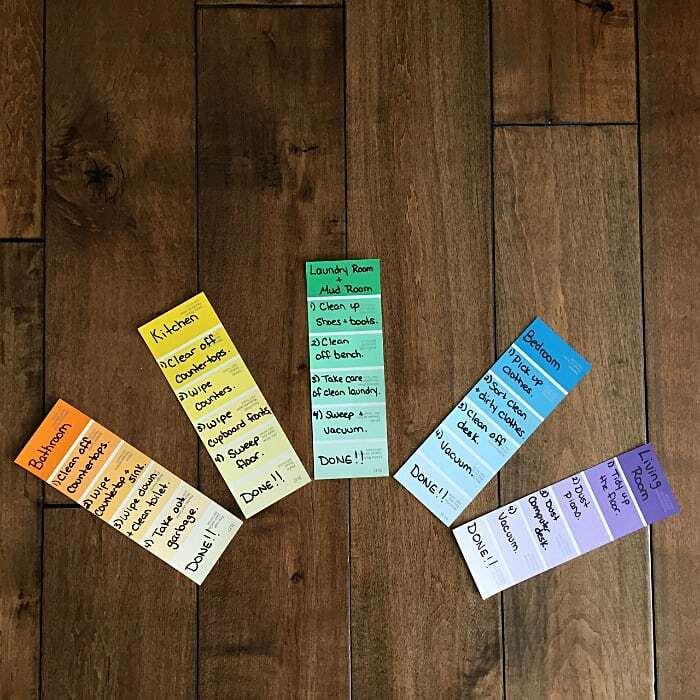 If you are looking for other chore chart ideas, you can check out our CHORE IDEAS page on different chore chart ideas, chore chart ideas for kids of all ages, and the things kids learn by doing chores. I love this idea so much! I’ve used it with success so I referred back to this post on one of my own blog posts, http://www.feedingfour.com/2017/02/06/the-only-way-my-house-stays-half-way-clean/. Thanks so much for the great idea! I absolutely love that idea. As soon as I seen that picture on Pinterest I feel instantly in LOVE! That was a brilliant idead! This is my first time writing out to someone on their blog because of their creative idea! I just wanted to say very good job! Thanks so much for taking the time to leave a comment. I am glad you like this idea! Have a wonderful day. Heck, I don’t even have kids. I saw this and wanted to use it for managing my chores!! That’s awesome! I am glad you like it. Anything to make chores more fun and organized!